EL PASO, Texas (WTVD) -- Former Wake Forest High School star Bryce Love took over for the absent Christian McCaffrey in the Stanford backfield, running for 119 yards and catching a 49-yard touchdown pass to help the No. 16 Cardinal beat North Carolina 25-23 on Friday in the Sun Bowl. 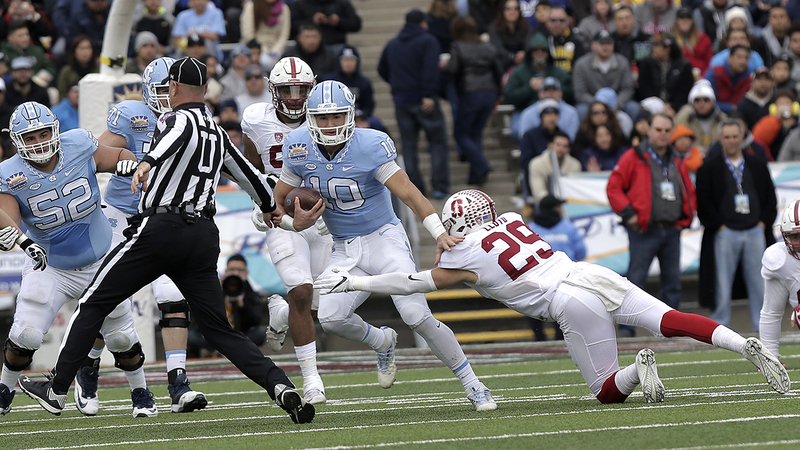 Stanford (10-3) held on after North Carolina (8-5) pulled within two with 25 seconds left on Mitch Trubisky's 2-yard pass to Bug Howard, sacking Trubisky on the 2-point conversion try. McCaffrey skipped the bowl game to focus on his NFL career. Stanford running back Bryce Love, right, who played at Wake Forest High School ran for 119 yards and had a 49-yard touchdown catch for the Cardinal's first score. Stanford took a 25-17 lead on Conrad Ukropina's 27-yard field goal with 3:23 left. North Carolina was forced to punt on its next series, but used two timeouts to get the ball back. After taking over at their own 3, the Tar Heels drove 97 yards in 10 plays and 1:11. After competing passes of 44 and 27 yards, Trubisky capped the drive with the 2-yard scoring pass to Howard. Stanford then sacked Trubisky on the 2-point try, a rush led by Solomon Thomas forcing the quarterback to retreat before being taken down. Thomas was selected the game's MVP, and the Cardinal defense also got a big game from safety Dallas Lloyd. Lloyd intercepted Trubisky's pass in the first half, then again early in the fourth quarter. He returned that one 19 yards for a touchdown to give Stanford a 22-17 lead. That stalled a North Carolina rally that saw it go from being down 13-7 at the half and 16-7 early in the third to taking a 17-16 lead. That came after a 37-yard field goal by Nick Weiler and a 5-yard TD run by Jordon Brown. The Cardinal faced a lot of problems Friday. Starting quarterback Kellery Chryst left with a knee injury in the second quarter, forcing backup Ryan Burns into the game. At that point, they were without their top two backfield weapons. The Cardinal also uncharacteristically shot themselves in the foot with penalties, including two crucial ones that forced it into field goal tries. They finished the game with 12 penalties for 85 yards. North Carolina quarterback Mitch Trubisky, left, and Stanford defensive lineman Solomon Thomas acknowledge each other after a hard-fought game in El Paso. Stanford also had a touchdown overturned on review. Ukropina kicked four field goals to tie a Sun Bowl record and was named the game's Most Valuable Special Teams Player. The Cardinal adjusted the game plan a little without McCaffrey, coming out throwing on four of their first five plays against a North Carolina defense loaded up to stop the run. The Tar Heels hurt themselves in the first half with two turnovers, each of which led to a field goal, then added a killer in the third quarter when Lloyd intercepted Trubisky's pass and returned it for a TD. UNC couldn't overcome those mistakes. Defensively, however, North Carolina was solid in the first half, holding Stanford to a field goal after a turnover at their own 19 and forcing the Cardinal to kick four field goals despite being in the red zone three times. For North Carolina, the big question is whether or not Trubisky will return next year. If so, the Tar Heels will return all but three players on offense, but will miss receiver Ryan Switzer and two starters on the line. Their season opener is Sept. 2 at home against California.